The Austrian library “Elias Canetti” in Ruse opened its doors for the first time on the 20th of May 2005 on the occasion of the 100-year anniversary of the Ruse-born laureate in literature Elias Canetti. The library was established upon the cultural agreement between Austria and Bulgaria and a treaty, signed between the Federal Ministry for Europe, Integration and Foreign Affairs of the Republic of Austria, represented by the Ambassador of Austria in Sofia, and the Governor of Ruse Municipality, and Ruse University “Angel Kanchev” and the International “Elias Canetti” Society. The library is a part of a network of Austrian libraries established by the Federal Ministry of Foreign Affairs of the Republic of Austria. The organisational tasks are being carried out by the International “Elias Canetti” Society in Ruse. In methodical terms, the Austrian library is supported and managed by the University library of Ruse University “Angel Kanchev”. The library stock is provided and complemented by regular deliveries from Federal Ministry for Europe, Integration and Foreign Affairs of the Republic of Austria and currently contains about 4500 books and journals with a focus on Austrian literature, history, culture, art and literary criticism, as well as European and World history, European integration and Balkan studies. The library contains the works of Elias Canetti in 19 languages – a donation from Dr. Thomas Franz Schneider (Basel, Switzerland). Literature from Germany, Liechtenstein and Switzerland can be found at the library. Part of the library stock is already included in an Internet-catalogue, which is integrated in the online library of the University of Ruse. At the library can be found also magazines, audio and video materials as well as CDs. On the 1st of January 2007, the day Bulgaria joined the European Union, the Foreign Minister of Austria Ms. Ursula Plassnik visited the library and donated 10 000 Euro for the enrichment of the library’s stock. The library’s activities aren’t limited to only providing literature. Since its establishent, the library has a function as a German – language centre for culture, science, information and civic education for the wider public. 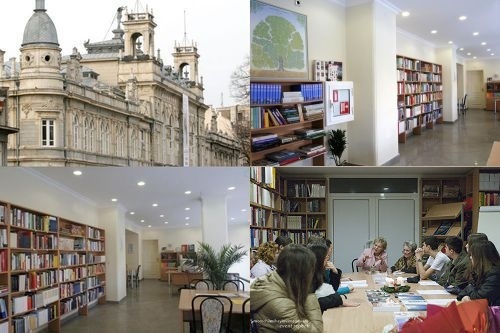 This additional role of the library is the result of the activities, carried out by the International “Elias Canetti” Society and the Publishing agency “IECS” which hold their offices in the premises of the library. The Austrian library participates in the organization of scientific, cultural and educational events: readings, reports, seminars, forums for discussions, conferences, presentations of books, exibitions, film screenings, theather performances, integration programs for students and citizens in partnership with the Department of European Studies at the University of Ruse, Bulgarian-Romanian Interuniversity European Center (BRIE), the Austrian Society for literarure in Vienna, Goethe Institute in Sofia and other cultural institutions in Bulgaria and abroad. The organization of the library is coordinated with the Austrian Embassy in Sofia, while the program of the library is coordinated with the International “Elias Canetti” Society.